Swann, Hunter & Wigham Richardson at Wallsend. Photographer unknown, main editor of the volume: Major General CO Nordensvan. - Det Stora världskriget vol. II , p. 347. Printed in Stockholm. 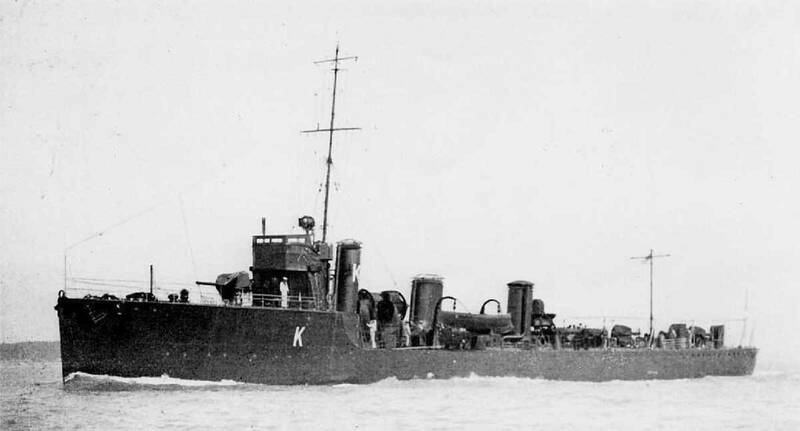 1915 photo of HMS Shark of the Royal Navy, built in 1912. K-class torpedo boat destroyer (950 tons, 31-32 knots). Similar to the L-class of destroyers in appearance, main obvious difference the varying height of the funnels. HMS Shark led attack on II German Scouting Group and received heavy gunfire which tore the forecastle gun off. Loftus Jones waived away the Acasta which had come to offer assistance. Jones and three other crew members continued firing the midship gun and engaged the German destroyer, V.48, which was eventually sunk. Jones was mortally wounded, his leg having been blown off. Later torpedoed by German torpedo boat S.54. Crew abandoned ship around 19:00 but Jones stayed with his ship. Seven crew members were later rescued by a Danish ship although one later died. Commander Loftus Jones received a posthumous Victoria Cross almost a year later, in March 1917, after his wife had organized the appeal with the Navy.